Managing a public relations campaign has never been an easy task, although in recent years a range of online tools have made the process simpler. As the Internet is still in its infancy these tools have been less than sophisticated and have, until recently, been largely ‘headcount’ based. As the Internet grows and the technology we use to access it changes, a greater level of sophistication is developing for public relations professionals, business owners and SEO marketing professionals. These developing tools offer the chance to manage, monitor and develop their online reputation and visibility and are rapidly evolving to create richer sources of information. From a handful of social networks and publishers only a few years ago the range of networks and links that a single campaign can generate has now gone a little stratospheric. Simple tools like Klout were fine in the early days, but real time reporting on mentions across a whole spectrum of sources needs a finer, more detailed approach; enter Topsy. Topsy is a new style reputation management tool and is well developed and very user friendly. While there are an increasing range of analytic tools and reputation management tools which will give you a good snapshot, headcount or score, Topsy offers a more robust approach. Measuring tweets and re-tweets is easy enough on Twitter itself, but the new generation of social media management tools offer more insight into what and where your campaign is appearing. 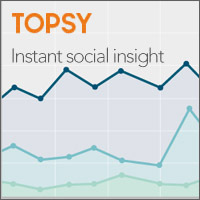 Topsy offers a detailed report in real time of mentions of a specific name, keyword or hashtag. In some senses it’s very similar to using search engine and the results are presented in search engine style, but with a more sophisticated set of results and tools to examine those results. There are free and paid versions of Topsy – the free version always being an attractive starting point for firms looking to test the available tools. In addition to the relatively basic free version there is also a free trial which gives you a fuller view of the tools capabilities that Topsy has to offer. Basic features include that headcount of mentions, but these are tracked in graph format over time and you can specifically focus in on a day, week, two weeks or month, on the basic version. Alongside this graph is a list of the top mentions in the previous twenty four hours, with links back to the sources. Topsy has, unlike many other reputation management and measuring tools moved away from the approach based purely on numbers. It’s easy to get obsessive about just how many mentions, re-tweets and links you’ve generated. A number, however, rarely offers much insight into the quality or nature of the conversation surrounding your public relations efforts. A good example was the recent announcement of a possible (maybe, perhaps) referendum on the UK’s membership of the EU. Entering ‘David Cameron’ into Topsy on the day of the announcement produced a very predictable graph showing a peak of mentions during the speech. However, in addition to this the sources quoting the story (in all major languages) were also presented, allowing a rapid overview of domestic and international opinion and reaction, including blogs, media stories and cartoons (of which there were many!). For PR professionals this kind of overview and information can be invaluable both for managing campaigns, spotting trends and also gauging public reaction to a campaign. Topsy offers a full range of tools in its paid version which is likely to be most useful to journalists and PR professionals, while for small firms the free version may be adequate. The site is not alone in the reputation management world but as yet is one of the leading tools in a new generation of its kind. While others will no doubt follow, Topsy is likely to remain at the head of the pack for some years to come. This post is contributed by Carlo Pandian, PR and social media expert for Media Recruitment, a communication job agency based in London.